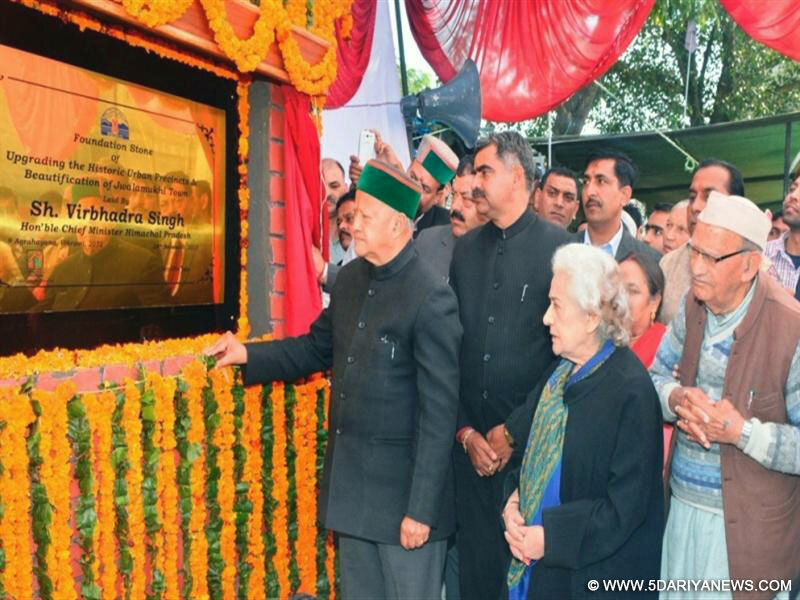 Chief Minister Shri Virbhadra Singh laying the foundation stone of Beautification project and multipurpose complex of Jawalamukhi town on 24 November 2015. Chief Minister Virbhadra Singh while addressing a public meeting at Jawalamukhi in district Kangra today said that he was quite happy that Himachal Pradesh had progressed a lot, but he was sad to see that the politics, not only in the State but everywhere in the country had deteriorated. He said that the way the slanderous language was being used by the leaders and the same being published by the media was not a welcome step and good for the future for the country.The Chief Minister said that he was not new in politics and since 1962, when he was a first time MLA, he had never seen politics stooping to such a low level.“ Even, one can attack at his opponents in a dignified way , by using soft and decent language” he said adding that it reflects that there was no decency left in political arena. He said that Jagat Prakash Nadda, who had asked for his ouster from the Chief Ministership which has appeared in media today was a calculated move of Sh. Nadda, and to remain in the line and eyeing for the post of Chief Minister.He said that even the central leadership had stooped very low and few central leaders were involved in carrying out political vendetta against me. The cases which were being pushed against me by State BJP leaders along-with a Union leader, by different investigating agencies was one and the same case being probed time and again. “ I call them (BJP) to invite FBI or other investigating agencies in order to probe in the case, they are interested to do so”, he said. He said that it was surprising that three different Central agencies have started investigations in one single case pertaining to the Income Tax returns which was already before the Income Tax Department and Appellate authorities at various stages. “Truth will prevail in the end”, he said and those involved to implicate me in false cases will be ashamed of themselves. Referring to Shri Prem Kumar Dhumal, he said that when he became Chief Minister for the first time, I was leader of opposition and Shri Dhumal had problem on that too and framed false Sagar Katha case against me. Second time when Dhumal became Chief Minister he implicated me in CD case and both the times I was acquitted by the courts both the time. “Unfortunately it is the habit of Prem Kumar Dhumal to create problems when in power for his opponents and his sons were following the similar suit and using derogatory language”, he said adding that till the time he was quite on these issues but now the time has come to explore the tactics of Dhumals. He said that rapid strides had been made in all sectors as far as development was concerned and the credit goes to the successive congress governments and in the field of education Himachal ranks second after Kerala. As far as health sector is concerned three more medical colleges were coming up in the state besides the existing two medical colleges and hospital at Shimla and Tanda. AIIMS like institute was coming up in Bilaspur district, IIT in Mandi, IIIT in Una and like wise many technical institutions all over the state providing skills to the youth in various trades. “I am happy that Himachal has progressed a lot but it was also necessary to preserve our traditions, heritage, culture and customs”. We need to preserve and maintain our ancient temples”, he said. Chief Minister announced upgradation of Civil hospital Jawalamukhi to 100 bedded and construction of additional storey therein. He also announced upgradation of health sub center Dhanote (Jurahi) to Primary health centre.He also operationalised Sub divisional Police officers office and office of Assistant Engineer of State electricity board limited at Jawalamukhi.The Chief Minister also performed the foundation stone laying ceremony of a stadium at Jawalamukhi to cost Rs 3 crore, foundation stone of Lift Irrigation Scheme for village Panjiyara in Jawalamukhi to cost Rs1.71 crore which will provide irrigational facilities to 50 hectares of land, foundation stone of Sewerage scheme for the left out habitation of Jawalamukhi town to cost Rs 3.92 crore and also performed foundation stone of Multipurpose project including Multi-storey parking and shopping complex to cost Rs 33 crore at Jawalamukhi to be funded by Asian Development Bank.Irrigation and Public Health Minister, Smt. Vidya Stokes while speaking on the occasion lashed the NDA government for rising prices of pulses and vegetables. She said that never in the history of the country the prices of pulses and vegetables had risen so high. She said that when the government started probe against the state BJP leaders, they, in unison with central leaders of BJP hatched conspiracies against the Chief Minister and were making futile attempts and talking about ousting the government. She said that the government had made a provision of Rs. 207.21 crore for various irrigation and drinking water supply schemes in Kangra district for 2015-16. For Dehra division a sum of Rs 11.35 crore had been made separately, she added.Earlier, MLA, Shri Sanjay Rattan welcomed the Chief Minister to his home segment and honoured him on the occasion. He also listed the developments of the area and thanked Chief Minister for dedicating projects and laying foundation stones of development projects worth Rs 67 crore in two days including development projects worth Rs 41 crore on his second day of tour to Jawalamukhi constituency. He also lambasted those few who were trying to the credit of development in Jawalamukhi assembly segment and airing rumours of sorts to create divide between Jawalamukhi and Dehra.MLAs, Shri Ajay Mahajan and Shri Yadvinder Goma, Chairman, Education Board, Shri Balbir Tegta, Vice-Chairman, Freedom Fighter Board, Shri Sushil Rattan, Vice-Chairman, Workers Welfare Board, Shri Surinder Mankotia, DC Kangra, Shri Ritesh Chauhan, SP, Kangra Shri Abhishek Dular, were also present on the occasion amongst others.